What the heck are these Yasso 800s and do I need to incorporate them into my training? Yasso 800s were invented by Runner’s World columnist Bart Yasso. Yasso was called ‘Chief Running Officer’ at Runner’s World, and he served as an ambassador to the sport to help develop its growth and popularity throughout the country. Yasso is a veteran of several marathons and other races including Badwater, and he’s also completed five Ironmans. He’s also coached countless runners to many PRs of their own. This man probably knows what he’s talking about! The Yasso 800s are a confidence boosting speed workout, mostly used in marathon training. 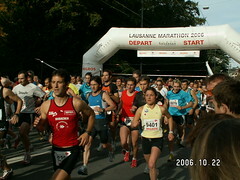 Most runners do them on a track, but they can be done on the roads on a measured course or using a GPS. Of course, you could also make like Clove and do them on the treadmill. The best part of Yasso 800s is that they are meant to predict your marathon time. Yasso the man based Yasso the workout on the premise that you can predict your marathon time based on your ability to perform 10 x 800 meter repeats with equal time rest. But the really extra cool thing is that the time for your repeats is your marathon goal time pushed over a colon. If your marathon goal time is x:yy:00 then your Yasso 800 repeat goal time is 0:0x:yy. For example, if you are striving to run a 3:30 marathon, you should be able to run 800 meters in three and a half minutes (3:30). The formula is simple, and it doesn’t discriminate between a 2:10 marathoner or a 4:15 marathoner; according to Yasso, the theory works for anyone training to hit a marathon goal time. The key Yasso 800 workout is 10 x 800 at Yasso 800 pace with equal time rest. The best time to do this workout is about 2-3 weeks out from race day in place of one of your speed workouts. This is the workout that will hopefully predict your marathon time. Of course, there are other factors such as weather, course profile and personal lives that affect marathon training and performance, but Yasso 800s are one way to assess your fitness level and whether your marathon goal is realistic. 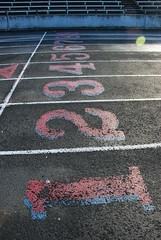 The formula is simple and easy to remember, and all you really need is 800 meters and a stop watch! Lastly, you can use Yasso 800s to predict your half time, too! Just double your goal half time and add eight – ten minutes for your equivalent marathon time. Then go about the Yasso 800s as if you were training for a marathon with that goal time. 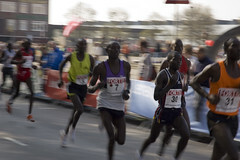 For example, if your goal half marathon time is 1:40, your equivalent marathon time is about three and a half hours. Your Yasso 800s would be around three and a half minutes. About 2 months before your goal race: identify your goal marathon pace and start with 4 x Yasso 800s, with equal time rest (e.g. if your goal is 3:30, then rest for 3:30 in between each Yasso 800). Each week into your training plan, add one more Yasso 800. About 2.5 weeks before your marathon, do 10 x Yasso 800s. So, let’s hear it Salty Readers. Do you incorporate Yasso 800s into your marathon training? If not, are you willing to give them a try? Previous Is BMI just a bunch of BS? Excellent post! My only issue is what Bart suggests. I really don’t like the idea of building up to the 10 x 800. To me, it seems this would get you good at running Yasso 800s, but might lose the workouts predictive abilities. Remember the goal of marathon training is to run your marathon time and not to run 800s at a certain pace. The best way, in my mind, to use the workout is to do your normal marathon training and then use the 10 x 800 workout to make sure that training worked. If you build up to 10 x Yasso 800s I would recommend going a little faster by the time you reach 10 x 800 to preserve the predictive value of the workout (5-10 seconds per 800). That means to get that 3:30 marathon, I’d want to run those Yassos around 3:20 – 3:25 if I did 6 weeks in a row of Yassos. I’ve always worked up to 10, but have aimed to go a second or two faster. Let us know how they work for you when you do give them a try! Would love to hear about your experience! I love Yassos but largely because they are a speed/track workout that is easy to benchmark against and see progress over time without a lot of technology and note taking. They are a great workout if you are straddled with the kids…..
Glad to hear that they work for you! I love the Yasso 800s for their simplicity, and the mental edge it gives me to know that I can likely reach my goal marathon time. Great to hear, Mary Lou! Liked your overview of the Yasso 800. Agreed, it seems that one should either use it either as a predictor OR as a workout with a slightly increased speed. It has proven to be a helpful tool to use as amateur runners. Yasso states that it is simply a correlation that worked for him. So it appears to me, there is often a lot of undue critism. Thanks for your comments! We appreciate you reading our posts!